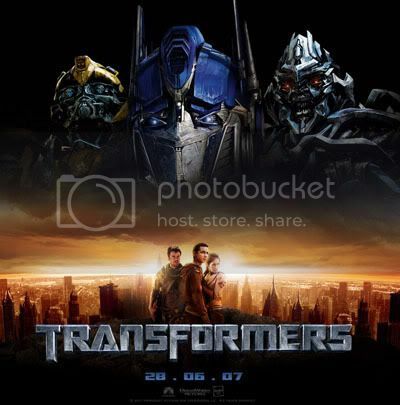 ~*~ Juz Mel: Part & Parcels of Life ~*~: It's still all about Transformers. It's still all about Transformers. Transformers came out a couple of weeks ago and oh man, I was an avid fan since small(due to my big brother's big collection of the action figures which I played with) and after watching the movie, I think I just went even more bonkers. The movie's plot wasn't so good, but hey the cinematics is the one that we're mostly there for right? It was almost as if you could feel yourself standing right next to Optimus Prime. :P The transformations were so cool! After the movie, Jason(also a mad transformers fan) and I keep imagining that the vehicles in our company were gonna transform into some powerful robot as well! Anyway, I still remembered that week when Tubbs came back from SG, he asked if I wanted to drop by Toys'R'Us to look for Bumblebee, I said "never mind it's okay", thinking I can get it easily another time. But hell, can you believe it? Bumbleebee is SOLD OUT absolutely in most of the major stores and prices are sky rocketing in ebay! But lucky me, I managed to get him, though I'm still missing the 2008 Camaro Deluxe Movie version. :( Those are going for around aud$100 on ebay! So as you can see, here's the current collection. If you think this is mad, hahaha, nooo I'm still not satisfied. Apart from wanting the 2008 Camaro Bumblebee version, I still want the Ultimate Bumblebee. It's RRP is US$89, but apparantly, some people got it for US $50. Darn, things always come out in the U.S first, it won't arrive to Australia until August or September. I watched that too!!! It was AWESOME!!! I'm planning for a 2nd go!Hehe!. 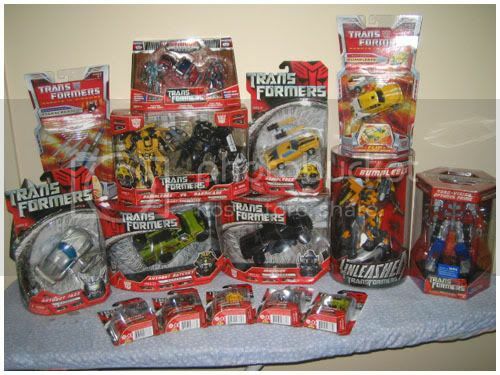 Your Transformers collection is .... unbelievable. Now I tot this is only for the boys. I'm wrong!